RUSH: “Bob Corker on Media: ‘I had a newfound empathy’ for Trump — ‘I told him that I’d had a healthy respect for the media. I deal with them all the time and, you know, to attack the media has not been something I’ve done. But I had a newfound empathy for him in watching how a totally debunked story’ spread across the political media.” This is Corker today on Fox & Friends. “The guys that actually wrote this bill knew I had nothing whatsoever to do with it. But then you have this reporter who says this. All of a sudden people that I respect in the news media, New York Times, Wall Street Journal, Washington Post, people start printing this as if it’s true.” And it wasn’t true, and they knew it wasn’t true. And Wolf kept pressing him, “Well, our sources say…” And then after Corker leaves they assembled a panel to beat up on Corker for writing a tax bill that benefited himself. And so he finally saw the light. He saw what’s been happening to Trump all year and now has a new understanding for it, which is all well and good, but why should it take it happening to you before you recognize that it’s happening to other people? No, no, no, no, no. I am not dumping on Senator Corker. I’m asking a question here about intelligence and observation and curiosity. Why should it require the media fake-newsing you before you understand that they’re fake-newsing a lot of other people? Why doesn’t Corker know Trump well enough to know that half the stuff or more they’re writing about him is bogus? Anyway, that’s an outside observation. 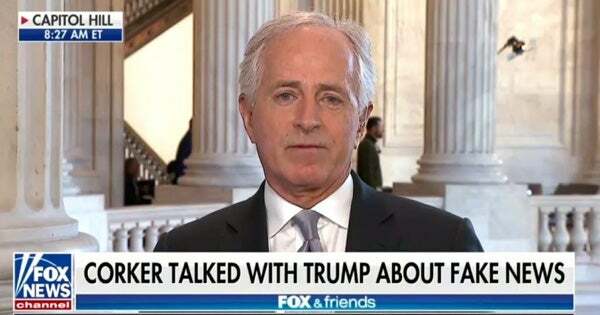 At least it did happen to Corker, and now, because of the personal experience, he has a greater understanding of what Trump has been going through. And that means others are going to now start developing an understanding of what Trump has been going through.